Ottawa entrepreneur Brenden Palmer knows there’s a better way to share documents. There’s more to sharing documents than just allowing access. That’s what separates his Ottawa startup NoteShares, from cloud based document storage lockers DropBox, Box.com and their hundreds of clones. We wanted to dive in and make sure that Palmer wasn’t just another DropBox copycat. Obviously DropBox has been very successful and in their success they’ve generated a startup a day. Adding a social aspect to documents makes them more open to discussion, commenting and discovery. Traditional cloud based lockers are really just dressed up ways to share attachments. 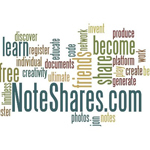 NoteShares is a social document sharing platform that allows you to connect with friends, share photos, and create new opportunities to learn, educate, and share. The platform creates a social experience around documents and user uploaded content. If I had to explain NoteShares to my grandmother I would start with something that she already has experience with, say, sending emails for example. Almost everyone connected to the internet uses email in some way, so I would start there. People have traditionally only shared documents (really all attachments) in one way before services and platforms like Dropbox, and Google Drive, and that is through sending them as attachments through email. I would then go on to tell her how this is a terrible way of sharing documents with a group of people, as in, sharing those documents socially. That is what NoteShares aims to accomplish. NoteShares is creating an online social platform that makes it easy to share and discover new content and documents that you would not have otherwise had access to. My name is Brenden Palmer, founder & CEO at NoteShares. I am currently the only full time founder on the team, but have some extensive experience developing web applications for local clients here in Ottawa, Canada. I am also studying Software Engineering at the University of Ottawa. We are currently based in Ottawa, Canada. How did you come up with the idea for NoteShares? I came up with the idea for NoteShares in my first year in university, while I saw how people were sharing documents with their friends. They were constantly sending emails to all of their friends with a bunch of attachments, trying to keep track of which documents they had already sent, and to which friends they had already sent them to. I thought to myself that there must be a better way, and then the idea just hit me. Originally I was going to somehow include documents or docs in the name because the whole premise of the platform is social document sharing. I then thought of a note, and how, usually, a note is in some way personal to the person who wrote that note. Again, since the whole premise of the platform is sharing documents (notes), we ended up with NoteShares. What problem does NoteShares solve? NoteShares solves the problem of how to share documents socially. We’re focusing on making a simple and effective platform for documents people already have created, or will create in the future. It’s impossible to just come up with one specific challenge, as they are all unique in their own ways, and there have been a lot to overcome. There have been a lot of technical challenges, as you can imagine, in trying to create a platform for documents because all documents have different formats. The challenge is making it universal, and making the platform “just work”. NoteShares is currently planning for a beta launch in January, and people can sign up on our website to become beta testers here! Startups from the U.S., Canada and around the world are coming here!